Law Office Fürstenow is located in Berlin city center, Friedrich­straße 61, directly at the Under­ground Station Stadt­mitte (U6), only 4 minutes away from the Gendar­men­markt. Law Office Fürstenow Berlin advises and repre­sents entre­pre­neurs as well as consumers nationwide on issues of commercial law with the focus on banking law, capital market law, capital investment law, real estate law, commercial contracts (e.g. license agree­ments, distri­b­ution agree­ments, partnership agree­ments, contracts for work and services, general terms and condi­tions). These include start‐ups, companies from the fields of e‐commerce, clean energy, technology and others. The law office repre­sents consumer interests defending them against those of banks, investment companies and insurance companies. Attorney Sascha C. Fürstenow provides legal support in all relevant legal issues, especially for company founders as well as start‐ups and young companies that have already been founded. Attorney Sascha C. Fürstenow is regularly invited by Univer­sities as a guest lecturer on the topic of start‐ups and company estab­lishment issues. Sascha C. Fürstenow has been an attorney at law admitted to the Berlin Barrister Associ­ation since 2007 and has been active throughout Germany since then. Studied law at the Humboldt‐Universität in Berlin and the Università degli Studi di Padova, Italy. Refer­en­dariat at the law firm Fiammenghi – Fiammenghi, in Rome, Italy. Worked in the Bundestag admin­is­tration, department for petitions. Languages: German, English and Italian. In addition to his work as a lawyer, Attorney Fürstenow is involved as a juror and consultant for start‐ups and founders in Berlin Brandenburg Business Compe­tition (BPW) and passes on his knowledge as a guest lecturer. as much time as necessary to develop individual results. experience and industry knowledge through many years of experience as a lawyer. This applies in particular to legal advice, contractual drafting, contractual review (especially loan agree­ments) as well as negoti­a­tions and litigation before civil courts. on the subject of general civil law. Lawyer Fürstenow is listed as a consultant in the KfW (Kredi­tanstalt für Wieder­aufbau) advisory exchange. legal repre­sen­tation (including assis­tance in arbitration and mediation proceedings). If a legal inquiry concerns a specific area of law or legal topic which lies outside the profes­sional compe­tence of the FÜRSTENOW Law Office, contact can be estab­lished with a suitable colleague from a number of cooper­ation partners, e.g. 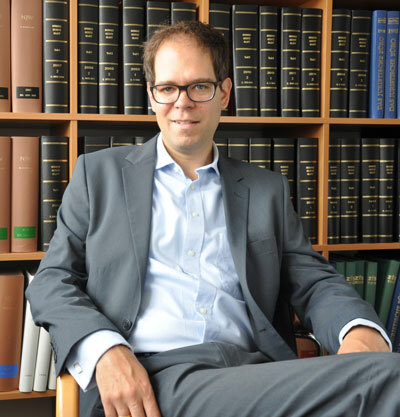 lawyer and specialist lawyer for copyright and media law Philipp Beck.